Differences in neuronal activity, including central dopaminergic transmission, are related to individual response to stress and drug selfadministration [1-4]. A series of experiments found that rats with high locomotor activity in response to novelty (HR; high-responder rats) exhibited a hyper dopaminergic state, both in resting conditions and after pharmacological and environmental stimulation, in comparison to rats with low locomotor activity (LR; lowresponder rats) [5-8]. HR rats displayed higher basal levels of dopamine (DA) in the nucleus accumbens (Acb) and in the prefrontal cortex (PFC) compared to LRs . However, Rogue- Pont et al. indicated that these individual differences in DA levels were relatively minor . Another study identified differential activation in the rat limbic system by immuno histochemical assessment of c-Fos, an immediate early gene product expressed in association with neuronal discharge . This study demonstrated that a single exposure to a novel environment did not lead to long-term enhancement of c-Fos expression in rats, as opposed to carrying out the same novelty test in conjunction with simultaneous movement of subjects to other rooms or social stress. In view of the various reports of neuronal activity in response to novelty, thorough and unambiguous delineations of the various patterns of excitation of individual cell groups, dependent on differentiated stimuli, are important. Such studies not only add to anatomical data, but can facilitate interpretations of results from experiments performed in rat models of neurological disorders such as drug addiction or Parkinson’s disease [10,11]. The largest cluster of midbrain dopaminergic cells is comprised of the dopaminergic neurons of the retrorubral field (RRF) (A8 group), the substantia nigra (SN) (A9 group), and of the ventral tegmental area (VTA) (A10 group), together the A8-A10 groups . These three main nuclei are involved in three complex circuitries – the mesostriatal, mesolimbic and mesocortical pathways. These pathways are involved in behavioral manifestations, motricity, learning, reward and also in neurological diseases . The RRF is located dorsally and caudally to the SNC. The RRF projects mainly to dorsal and ventral striatum as well as the piriform and entorhinal cortices (Deutch et al. ), and also to the extended amygdala [14-16]. It is known that in the RRF are dopaminergic [17-19] and non-dopaminergic neurons . Nair-Robert et al. found that in rats the total number of midbrain dopaminergic neurons was approximately 71,000 (bilateral count) of which approximately 6,100 dopaminergic cells belonged to the RRF (A8 group) . Additionally, the A8 dopamine cell cluster, contained in the caudal midbrain reticular formation, corresponding to the RRF, does not permit any subdivisions as compared to the A10 and A9 groups [22-24]. Morphometric analysis showed no significant differences in the average area of A8 dopaminergic cells compared to average area in other midbrain dopaminergic cells (A10 and A9 groups) . Thus, there are differences in THexpression between the midbrain dopaminergic groups A8-A10. It is also know, that these differences together with differences density of c-Fos+in VTA and SN were observed in rats with various levels of spontaneous locomotor activity response to novelty: HR and LR rats [9,26]. However, we have not found such reports regarding RRF research in these rats. Thus, considering the functional and pathological relevance of DA it is necessary to expand studies on the A8 dopaminergic cell group in rats with various levels of spontaneous locomotor activity response to novelty (HR vs. LR rats). The aim of the present study was to investigate for differences in number and morphology of RRF dopaminergic neurons, identified by the presence of the enzyme tyrosine hydroxylase (TH+), between HR and LR rats. We additionally assessed for c-Fos protein reactivity in the RRF using double immunofluorescence staining (c-Fos+/TH+) to examine for differences in neuronal activity of this nucleus [27-29]. Such studies have not previously been described and provide novel insights into cell populations involved in novelty-seeking behavior. All experiments were carried out in accordance with the rules of the Local Ethical Committee of the Medical University of Gdansk (No 16/2014). All efforts were made to minimize both the discomfort and the number of animals. Studies were performed using male Wistar rats (Tri – City Central Animal Laboratory, Research and Service Centre of the Medical University of Gdansk, Poland, n=22) weighing approximately 200-250 g at the time of arrival. According to the method of Piazza et al. the level of spontaneous locomotor activity in response to novelty was based on the rats’ horizontal activity as measured for 2 h (4.00–6.00 p.m.) in an actometer (Opto Varimex Minor–Columbus, USA) . The number of photocell counts accumulated over a 2 h period for each rat was used as an index of individual responsiveness to the novel environment. According to the method of Lucas et al. only the upper and lower scores for five rats were used for the immunohistochemical study . The median locomotor activity score for all the rats was 3369 (minimum value: 1246, maximum value: 8000; mean ± SE: 3671 ± 387 photocell counts). The animals were divided into two HR and LR categories based on the distribution of photocell counts (with ± SE) in the entire population. Subjects with an activity score above 4,258 were classified as high responders (HR=5) and those with an activity score below 2,794 were classified as low responders (LR=5). The remaining rats (with intermediary score) were not taken to next procedures (n=12). Immunohistochemical procedures for identifying TH+ cells, as well as localization and immunofluorescent imaging of combined TH+/c-Fos+, were performed one hour after the novelty test, according to Majkutewicz et al. and Kumer and Vrana [32,33]. In order to determine baseline c-Fos expression (density of c-Fos positive cells) and TH+ cells, all animals were sacrificed directly after being removed from their home cages. The brains were removed and post-fixed in fixative solution for 24 h, and then stored for 48 h in phosphate buffered saline (PBS) containing 30% sucrose for cryoprotection. The frozen all RRF region of the brains were cut on a cryostat into 30 μm thick sections in the frontal plane (bregma: from -6.36 mm to -7.20 mm) according to the atlas by Paxinos and Watson . Briefly, prior to all immunohistochemical steps, brain sections were rinsed several times in PBS, then incubated in 0.3% hydrogen peroxide in PBS for 10 min at room temperature and then blocked for 45 min with a solution of 1% Bovine Serum Albumin (BSA, BioChemika, Fluka) for reduction of nonspecific binding, and afterwards incubated in 0.3% Triton X-100 in PBS at room temperature. The sections were then incubated in polyclonal rabbit anti-TH antibody (Chemicon, Millipore, USA; at a dilution of 1:1500 in PBS containing 0.3% TritonX-100 and 3% Normal Goat Serum (NGS, Sigma)) at 4°C for 3 days. Next, after 30 min incubation at room temperature with biotinylated goat anti-rabbit IgG (Vector, USA; dilution of 1:200 in PBS containing 0.02% sodium azide and 0.3% Triton X-100), the sections were rinsed with PBS+Triton, incubated with avidin–biotin peroxidase complex (ABC, Vector Elite Kit, USA; dilution of 1:100 in PBS) for 1 h and next with Tris buffer (Tris buffer, pH 7.6; BioChemika, Fluka) with diaminobenzidine tetrahydrochloride (DAB, Sigma; solution 40 ml Tris/30 mg DAB). After a few minutes, the sections were finally incubated with 30% hydrogen peroxide (H2O2, Eurochem BGD, Poland; solution of 90 ml H2O2/10 ml PBS), and allowed to react for 15-20 min. The reaction was controlled and stopped in Tris buffer when the TH-immunoreactive cells appeared brown. The tissue sections were placed on slides, air dried and, after dehydration with ethanol, mounted with DPX (Fluka). All steps of the double staining procedure were performed at room temperature. The sections were rinsed with PBS (pH 7.4), incubated in NGS (Sigma; 5% NGS containing 0.3% Triton X-100) for 30 min and again rinsed with PBS. Following incubation with a blocking solution containing 0.5% BSA (Sigma) and PBS for 20 min, the sections were incubated with primary antibodies (polyclonal rabbit anti- TH, Chemicon, Millipore, USA; c-fos mouse monoclonal IgG, Santa Cruz Biotechnology, USA; at a dilution of 1:1500 in PBS containing 0.3% TritonX-100 and 3% NGS (Sigma)), washed with PBS/BSA (Sigma), and probed with CF488A Goat Anti-Rabbit IgG, spectrally similar to Alexa Fluor 488/CF543 Goat Anti- Mouse IgG, spectrally similar to Alexa Fluor 546; Biotium; at a dilution of 1:500). Immunohistochemical and fluorescent images were taken by light microscope, Leica DC300 (Leica Microsystems, Germany), or fluorescent microscope, Primo Star (four-channel system) (Carl Zeiss MicroImaging GmbH, Germany) (magnification 4 × 10, 20 × 10 and 100 × 10). All the immunohistochemical images were analyzed by Leica QWin Software and fluorescent images were white-labeled on a black background, in a grayscale ranging from 0 (black) to 255 (white), and processed using the Software from Carl Zeiss Imaging Systems (Axio Vision Rel. 4.9.1). The number of TH+ cells within the RRF structure were counted in each of its region section subjected to staining using a light microscope Leica DC300 (magnification 4 × 10) and Leica QWin Software (Serial No. 4358). Five to seven sections per rat per each bregma level were taken to statistical analysis for immunohistochemistry TH-expression. We performed a correlation analysis between the total number of TH+ cells (counted in the whole A8 dopaminergic region, both left and right hemispheres together) and the locomotor activity score in the novel environment test in both behavioral groups (HR=5 and LR=5). For regression analysis, we used the Pearson correlation coefficient (Rp), with the level of P<0.05 being accepted as statistically significant. Next, the data were statistically analyzed using two-way ANOVA with two factors: behavioral group (HR and LR) and laterality (right and left hemisphere). The differences in the means were further analyzed with Tukey’s post hoc test (P<0.05 was considered as significant) for TH+. In addition, for comparison between the right and left hemisphere in both HRs and LRs, the mean numbers of TH+ cells in the RRF were compared in its rostro-caudal extensions (bregma) with one-way ANOVA. The differences in the morphometric measurements (area (in square μm), diameter, perimeter, width and height (parameters of the bounding cuboid of a 3D region), major and minor ellipses (length of the main axis and the secondary axis of the ellipse with the same geometric moment of inertia as the 3D region) (in μm), and circularity factor (in square μm/square μm)) in cells with TH+ expression between the HR and LR rats in the RRF were compared using one-way ANOVA. The same tests were used to analyze c-Fos expression and presented as the mean density of c-Fos+ cells (number/mm2). All statistical calculations were performed using SPSS 20.0 for Windows (IBM SPSS Statistics 20). 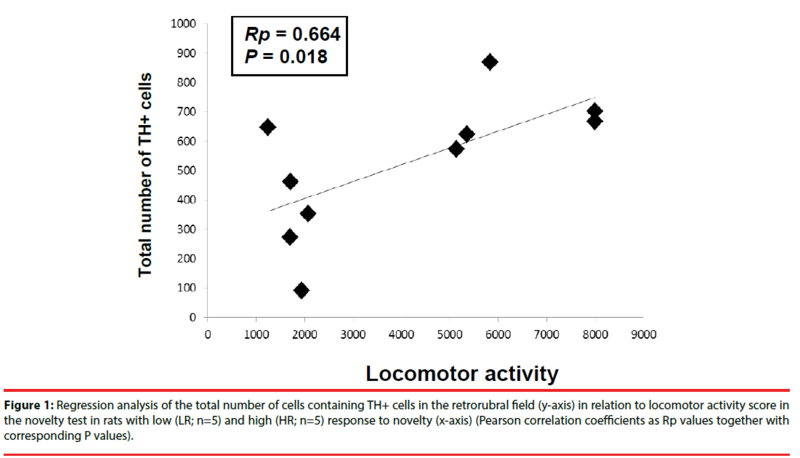 The correlation between the locomotor activity score in the novel environment test and the total number of TH+ cells counted in the RRF (A8 dopaminergic cells) in both hemispheres for HR and LR animals was positive and statistically significant based on Pearson analysis (Rp=0.664 and P<0.05) (Figure 1). However, HR/LR differences in the mean numbers of TH+ cells were not significant (F(1,70)=0.072, P>0.05). In turn, Tukey’s post hoc test revealed no significant group x laterality interaction in the RRF (HR: right x left hemispheres: P=0.786; LR: right × left hemispheres: P>0.05), therefore the results of both hemispheres were averaged for further analysis. Figure 1: Regression analysis of the total number of cells containing TH+ cells in the retrorubral field (y-axis) in relation to locomotor activity score in the novelty test in rats with low (LR; n=5) and high (HR; n=5) response to novelty (x-axis) (Pearson correlation coefficients as Rp values together with corresponding P values). 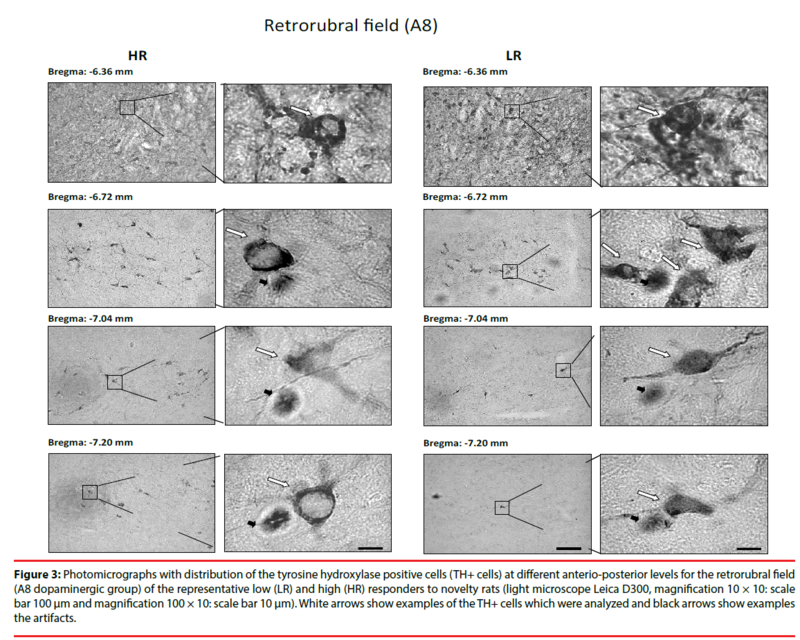 Detailed analysis of the anterio-posterior axis of the RRF revealed regional HR/LR differences in the TH+ cells (A8 dopaminergic group) distribution as shown in Figure 2 and Figure 3. There were significantly higher numbers of TH+ cells in the LR rats than in the HR rats in the anterior RRF (bregma level: (-6.36): F(1,21)=9.348, P<0.01). However, in the posterior RRF (bregma: (−7.04)) a significantly higher number of TH+ cells were found in HR rats compared to LR rats: F(1,21)=128.906, P<0.001). No differences in the number of TH+ cells were identified in medial RRF between HR and LR rats (bregma levels: (−6.72)-(−6.80): F(1,21)=1.696, P>0.05). In addition, there were no significant group × laterality interactions. Figure 2: Distribution of the tyrosine hydroxylase positive cells (TH+ cells) at different anterio-posterior levels for the retrorubral field (A8 dopaminergic group) in HR (n=5) and LR (n=5) rats. Explanations: ** P<0.01, and *** P<0.001 differences between the HR and LR groups (Tukey’s post hoc test)). Figure 3: Photomicrographs with distribution of the tyrosine hydroxylase positive cells (TH+ cells) at different anterio-posterior levels for the retrorubral field (A8 dopaminergic group) of the representative low (LR) and high (HR) responders to novelty rats (light microscope Leica D300, magnification 10 × 10: scale bar 100 μm and magnification 100 × 10: scale bar 10 μm). White arrows show examples of the TH+ cells which were analyzed and black arrows show examples the artifacts. We conducted a morphological analysis of THexpressing cells, assessing single-cell samples using immunofluorescence imaging. The automatic criterion for choosing cells for analysis required that the whole soma was present in a given section and was determined by staining intensity (for example, cells marked with a white arrow in Figure 4). Figure 4: Immunofluorescent localization of c-Fos protein (c-Fos+) (red signal) and tyrosine hydroxylase positive cells (TH+ cells) (green signal) (magnification 20 × 10; scale bar=100 μm.) (photographs 1-3 and 5-7) with their scattergrams of colocalization (photographs 4 and 8), and selection of c-Fos+ and TH+ cells for the morphometrical assessment (white arrows) in the retrorubral field in the representative high (HR) and low (LR) responder to novelty rats. Photographs were taken with fluorescent microscope Primo Star (Carl Zeiss MicroImaging GmbH, Göttingen, Germany) (picture definition 1024 × 1024 points) and with the use of computer program Axio Vision Rel 4.8 from Carl Zeiss Imaging System. The analysis revealed significant HR/LR differences in all basic neuron morphological features (HR group vs. LR group; cell area: F(1,104)=69,296, P<0.001; diameter: F(1,104)=82,006, P<0.001; perimeter: F(1,104)=68,312, P<0.001; cell height: F(1,104)=40,426, P<0.001; cell weight: F(1,104)=45,065, P<0.001; ellipse major: F(1,104)=52,641, P<0.001; ellipse minor: F(1,104)=65,553, P<0.001 and circularity factor: F(1,104)=4,103, P<0.05). These data are shown in Table 1. Explanations: The data are presented as mean ± SEM, P<0.05 (*) and P<0.001 (***): statistical differences between the HR and LR rats (ANOVA), n – number of sampled images. Table 1: Analysis of basic morphological parameters (cell area, diameter, perimeter, height and weight of cell, major and minor ellipse, and circularity factor) for all of the tyrosine hydroxylase positive cells (TH+ cells) in the retrorubral field (A8 dopaminergic group) in rats with high (HR) and low (LR) behavioral reactivity to novelty. The density of c-Fos+ (number/mm2) was low and did not significantly differ between behavioral groups (9.89 ± 5.83 in HRs vs. 5.08 ± 1.58 in LRs; P>0.05) and between their hemispheres (HRs: 12.28 ± 5.42 in right hemisphere vs. 4.36 ± 2.74 in left hemisphere, P>0.05; LRs: 6.12 ± 4.73 in right hemisphere vs. 4.02 ± 2.03, P>0.05) (Anova test). In addition, Figure 4 presents selected photographs of c-Fos+ (red signal; Figure 4-1 and 4-5) and TH+ expression (green signal; Figure 4-2 and 4-6) indicating their lack of colocalization (scattergrams; Figure 4-4 and 4-8) in RRF in the representative HR (Figure 4-1 and 4-4) and LR (Figure 4-5 and 4-8) rats. The present experiments indicate that the RRF differs in the total number, distribution, and morphology of its dopaminergic cells in rats with divergent levels of spontaneous locomotor activity (HR vs. LR rats) and displays a low density of c-Fos+ after single-exposure novelty testing. (1) The HR rats had a higher total number of TH+ cells in the A8 region in comparison to LR rats. (2) The HR/LR differences in TH+ expression were found in the distribution of the anterio-posterior axis of this structure as well as the morphology of TH+ cells. The anterior RRF of LR rats contained more TH+ cells than HR rat anterior RRF, whereas posterior RRF contained more TH+ cells in HR rats. Single cell morphological analyses demonstrated significant HR/LR differences for all analyzed morphometric factors. (3) Finally, no differences were observed between HR and LR rats in density of c-Fos+ cells and no colocalization of c-Fos+/TH+ was observed. In a previous study we found that HR rats had higher total numbers of TH+ cells in midbrain A9-A10 dopaminergic regions  and in the hypothalamic A11-A15 dopaminergic region if they were analyzed as a whole region and when compared as separate dopaminergic cell groups . TH+ cell morphology in the SNVTA cells did not differ significantly between HR/LR behavioral groups , which were in contrast to the morphological finding in TH+ hypothalamic cells. These differences were especially evident in the area and perimeter of all A11-A15 hypothalamic dopaminergic cells, where single cell area and perimeter was larger in the HR groups in comparison to the LR groups . Our current studies indicate that TH+ cells in the A8 group are smallest relative to TH+ cells within the A9-A15 groups. This result differs from the findings by other researchers for TH+ cells in RRF [13,22,23,36]. The variation between findings may result from regional comparison differences (analysis of whole region or individual sub regions). For instance, Fu et al. performed a thorough morphological analysis of the individual A9-A10 regions (analysis of the subregions of the SN and VTA) . The A8 region was compared as a whole against individual subregions of A9 and A10. In addition, the divergent studies were performed on various animal species, including mice , laboratory rats , other rodents [22,36], monkeys , and bats . Thus, the results must be considered with recognition that interstrain and interspecies differences (such as differences in the number of midbrain neurons) exist . Earlier studies have demonstrated [22,36] that in larger rodents A8 neurons were not particularly numerous and were not densely packed. The soma of these neurons was round and multipolar, with dendrites showing no specific orientation. Similar observations in monkeys have been made by Cavalcanti et al. . They showed that the A8 neurons are sparsely distributed cells with ovoid or fusiform shapes, and did not show a dendritic organization pattern. In turn, in laboratory rats, DA neurons in the RRF labeled by immunohistochemistry were estimated up to number 6,100 (bilaterally) . In mice outside of TH+ cells in A9 and A10 groups are a differentiated cytoarchitecture of TH+ cells in A8 group . In addition, the main dopaminergic cell groups of the mouse brain were found to be similar to those observed in rats and humans in terms of diversity. It has also been shown that the expression patterns of selected biomarkers markedly differ between A8, A9, and A10 neurons . In bats, TH+ neurons displayed a medium average area in the RRF (A8 group) compared to TH+ neurons of the SN (A9 group) and VTA (A10 group). Additionally, these A8 neurons were round and mostly bipolar, with dendritic fields in a dorsoventral orientation . The number of DA neurons in the RRF has been quantified extensively in different species of animals [13,22,36,24,25,21], but, prior to this study, the number and distribution of DA cells in rats after a one-time novelty test had not been assessed. Regarding c-Fos protein detection, the results correlate with our previous study , where neuronal activation, especially within limbic structures, was not observed as indicated by c-Fos+ cells in rats after a single novelty test. These results together suggest that acute experiments such as a one-time exposure to a novel environment may not stress the rats sufficiently to lead to long-term limbic system enhancement of c-Fos expression, which is found following a novelty test carried out when rats are simultaneously moved to other rooms or subjected to social stress. Recently a growing number of neurophysiological differences between HR and LR individuals have been described [30,38,39]. Thus, it suggests that biological determinants of increased susceptibility to stress are linked to the central dopaminergic systems. The present work provides evidence that variable activity in rats in a novel environment is correlated with differential TH expression in the A8 dopaminergic cell group of the RRF. Additionally, our results may have particular significance for studies concerned with the function or pathology of individual dopaminergic neurons (e.g. in Parkinson’s disease, schizophrenia, and drug addiction) using a rat model. We thank Irena Jerzemowska for the English revision of our manuscript. This study was financed by the Polish National Science Center (NCN) (decision no: DEC- 2013/09/D/NZ4/02499) and by the Faculty of Biology, University of Gdańsk, Poland. The authors declare that they have no conflict financial interests. Moal ML, Simon H. Mesocorticolimbic dopaminergic network: functional and regulatory roles. Physiol. Rev 71(1), 155-234 (1991). Piazza PV, Le Moal ML. Pathophysiological basis of vulnerability to drug abuse: role of an interaction between stress, glucocorticoids, and dopaminergic neurons. Annu. Rev. Pharmacol. Toxicol 36(1), 359-378 (1996). Smith WJ, Stewart J, Pfaus JG. Tail pinch induces fos immunoreactivity within several regions of the male rat brain: effects of age. Physiol. Behav 61(5), 717-723 (1997). Wise RA, Rompre PP. Brain dopamine and reward. Annu. Rev. Psychol 40(1), 191-225 (1989). Hooks MS, Colvin AC, Juncos JL, et al. Individual differences in basal and cocaine-stimulated extracellular dopamine in the nucleus accumbens using quantitative microdialysis. Brain. Res 587(2), 306-312 (1992). Piazza PV, Maccari S, Deminiere JM, et al. Corticosterone levels determine individual vulnerability to amphetamine selfadministration. Proc. Natl. Acad. Sci. USA 88(6), 2088-2092 (1991). Rogue-Pont F, Piazza PV, Kharouby M, et al. Higher and longer stress-induced increase in dopamine concentrations in the nucleus accumbens of animals predisposed to amphetamine self-administration. A microdialysis study. Brain. Res 602(1), 169-174 (1993). Verheij MMM, Cools AR. Differential contribution of storage pools to the extracellular amount of accumbal dopamine in high and low responders to novelty: effects of reserpine. J. Neurochem 100(3), 810-821 (2007). Majkutewicz I, Myślińska D, Jerzemowska G, et al. Stress-induced differences in the limbic system Fos expression are more pronounced in rats differing in responsiveness to novelty than social position. Brain. Res. Bull 89(1), 31-40 (2012). Pakkenberg B, Moller A, Gundersen HJ, et al. The absolute number of nerve cells in substantia nigra in normal subjects and in patients with Parkinson’s disease estimated with an unbiased stereological method. J. Neurol. Neurosurg. Psychiatry 54(1), 30-33 (1991). Ma SY, Roytta M, Rinne JO, et al. Single section and disector counts in evaluating neuronal loss from the substantia nigra in patients with Parkinson’s disease. Neuropathol. Appl. Neurobiol 21(4), 341-343 (1995). Björklund A, Dunnett SB. Dopamine neuron systems in the brain: an update. Trends. Neurosci 30(5), 194-202 (2007). Cavalcanti JRLP, Pontes ALB, Fiuza FP, et al. Nuclear organization of the substantia nigra, ventral tegmental area and retrorubral field of the common marmoset (Callithrix jacchus): A cytoarchitectonic and TH-immunohistochemistry study. J. Chem. Neuroanat 77(1), 100-109 (2016). Deutch AY, Goldstein M, Baldino F Jr, et al. Telencephalic projections of the A8 dopamine cell group. Ann. NY Acad. Sci 537(1), 27-50 (1988). Hasue RH, Shammah-Lagnado SJ. Origin of the dopaminergic innervation of the central extended amygdala and accumbens shell: a combined retrograde tracing and immunohistochemical study in the rat. J. Comp. Neurol 454(1), 15-33 (2002). Zahm DS, Cheng AY, Lee TJ, et al. Inputs to the midbrain dopaminergic complex in the rat with emphasis on extended amygdala-recipient sectors. J. Comp. Neurol 519(16), 3159-3188 (2011). Hnasko TS, Chuhma N, Zhang H, et al. Vesicular glutamate transport promotes dopamine storage and glutamate corelease in vivo. Neuron 65(5), 643-656 (2010). Lapish CC, Seamans JK, Chandler LJ. Glutamate-dopamine cotransmission and reward processing in addiction. Alcohol Clin. Exp. Res 30(9), 1451-1465 (2006). Tecuapetla F, Patel JC, Xenias H, et al. Glutamatergic signaling by mesolimbic dopamine neurons in the nucleus accumbens. J. Neurosci 30(20), 7105-7110 (2010). Swanson LW. The projections of the ventral tegmental area and adjacent regions: a combined fluorescent retrograde tracer and immunofluorescence study in the rat. Brain. Res. Bull 9(6), 321-353 (1982). Nair-Roberts RG, Chatelain-Badie SD, Benson E, et al. Stereological estimates of dopaminergic, gabaergic and glutamatergic neurons in the ventral tegmental area, substantia nigra and retrorubral field in the rat. Neuroscience152(4), 1024-1031 (2008). Cavalcanti JRLP, Soares JG, Oliveira FG, et al. A cytoarchitectonic and TH-immunohistochemistry characterization of the dopamine cell groups in the substantia nigra, ventral tegmental area and retrorubral field in the rock cavy (Kerodon rupestris). J. Chem. Neuroanat 55(1), 58-66 (2014). Fu YH, Yuan Y, Halliday G, et al. A cytoarchitectonic and chemoarchitectonic analysis of the dopamine cell groups in the substantia nigra, ventral tegmental area, and retrorubral field in the mouse. Brain. Struct. Funct 217(2), 591-612 (2012). German DC, Manaye KF. Midbrain dopaminergic neurons (Nuclei A8, A9, and A10): three-dimensional reconstruction in the rat. J. Comp. Neurol 331(3), 297-309 (1993). Medeiros HHA, Santana MAD, Dias Leite M, et al. The cytoarchitectonic and TH-immunohistochemical characterizationof the dopamine cell groups in the substantia nigra, ventral tegmentalarea and retrorubral field in a bat (Artibeus planirostris). Neurosci. Res 112(1), 37-46 (2016). Jerzemowska G, Plucińska K, Kulikowski M, et al. Locomotor response to novelty correlates with the number of midbrain tyrosine hydroxylase positive cells in rats. Brain Res. Bull 87(1), 94-102 (2012). Boucher AA, Arnold JC, Hunt GE, et al. Resilience and reduced c-Fos expression in P2X7 receptor knockout mice exposed to repeated forced swim test. Neuroscience 189(1), 170-177 (2011). Martinez M, Calvo-Torrent A, Herbert J. Mapping brain response to social stress in rodents with c-fos expression: a review. Stress 5(1), 3-13 (2002). Morrison KE, Curry DW, Cooper MA. Social status alters defeat-induced neural activation in Syrian hamsters. Neuroscience 210(1), 168-178 (2012). Piazza PV, Deminiere JM, Le Moal M, et al. Factors that predict individual vulnerability to amphetamine self-administration. Science 245(1), 1511-1513 (1989). Lucas LR, Angulo JA, Le Moal M, et al. Neurochemical characterization of individual vulnerability to addictive drugs in rats. Eur. J. Neurosci 10(10), 3153-3163 (1998). Majkutewicz I, Cecot T, Jerzemowska G, et al. Lesion and stimulation of the ventral tegmental area increases cholinergic activity in the rat brain. Acta Neurobiol. Exp. (Wars)70(1), 28-39 (2010). Kumer SC, Vrana KE. The intricate regulation of tyrosine hydroxylase activity and gene expression. J. Neurochem 67(2), 443-462 (1996). Paxinos G, Watson C. The Rat Brain in Stereotaxic Coordinates. San Diego (2006). Jerzemowska G, Plucińska K, Kuśmierczak M, et al. Locomotor response to novelty correlates with differences in number and morphology of hypothalamic tyrosine hydroxylase positive cells in rats. Brain Res. Bull10(1), 26-36 (2014). Dwarika S, Maseko BC, Ihunwo AO, et al. Distribution and morphology of putative catecholaminergic and serotonergic neurons in the brain of the greater canerat, Thryonomys swinderianus.J. Chem. Neuroanat 35(1), 108-122 (2008). Zaborszky L, Vadasz C. The midbrain dopaminergic system: anatomy and genetic variation in dopamine neuron number of inbred mouse strains. Behav. Genet 31(1), 47-59 (2001). Kabbaj M, Akil H. Individual differences in novelty-seeking behavior in rats: a c-fos study. Neuroscience 106(3), 535-545 (2001). Kabbaj M, Devine PD, Savage VR, et al. Neurobiological correlates of individual differences in novelty-seeking behavior in the rat: differential expression of stress-related molecules. J. Neurosci 20(18), 6983-6988 (2000).